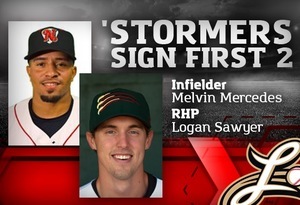 (Lancaster, Pa., Feb. 5, 2019) - Infielder Melvin Mercedes and RHP Logan Sawyer have become the first two players signed by the Lancaster Barnstormers for the 2019 season, it was announced today by manager Ross Peeples. Mercedes, 27, spent the last seven campaigns in the Oakland farm system, including two tours of duty with Class AAA Nashville. A native of New York City, Mercedes was drafted in the 16th round out of Central Florida in 2012. He made an immediate splash with the A’s organization, batting .381 in 31 games in the Arizona League (Rookie). His overall average in 527 minor league games is .251. The versatile switch hitter has, at some point, played each of the nine positions on the field in his career, including 11 games on the hill and one inning apiece at first base and behind the plate. He has spent the bulk of his time at second base third base and shortstop. Sawyer, 26, pitched in the Colorado organization from 2014-16 after being drafted by the Rockies in the 29th round. He was a nine-game winner between Class A- Boise and Class A Asheville in 2015 and appeared in 20 games, all in relief, covering only 24 2/3 innings in 2016. The right-hander from Knoxville, TN, missed two lengthy stretches of the 2016 season and has not appeared in a game since. He underwent “Tommy John” surgery a year ago.